Sensitive pricing can make or break your operation. Pricing decisions should never, ever, be made arbitrarily. It is crucial to achieve that fine balance between pricing for optimum profits and making customers feel that they're getting value for money. Of course, you want to sell the drinks at their optimum sales volume, but if you tip the balance by raising the sales price too high, the sales volume will actually drop. So will the profits. Research target audience. Investigate your potential market. Check out the opposition, even if this means visiting every liquor outlet in your locality. Get a feel for how much guests are prepared to pay for certain types of drinks. Compete. A realistic view of market positioning is essential. Aim to match, beat or pitch for exclusivity (known as a "highball decision", in the beverage industry). All three methods can work. What won't work is a "muddling along" approach. Make a decision, set your goals and price accordingly. Type of operation. Customers' image and perception of your establishment play a major role in establishing a pricing structure. Guests have fixed expectations about costs. For example, they expect to pay above-average price at a smart nightclub or "adult" establishment. They expect neighborhood bars, on the other hand, to be cheaper. 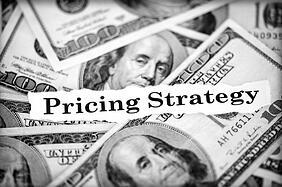 Devise a pricing strategy that meets customer expectations. Portion costs. You may have done your research and drawn up the perfect plan to wipe out the opposition, but, if you haven't "bought in" at competitive prices, you're not going to win. Keep portion costs to a minimum by buying low. Having carefully considered all aspects of your pricing strategy, including cost, availability, competition and target audience, it is essential to make your pricing plan as user-friendly and easy to operate as possible. Simplify. Price lists. A complicated price list with too many options and variables leads to employee confusion and incorrect charging. Even if those errors result in higher gross sales, customers will soon complain and you will lose business. Devise main price categories. Group products according to their wholesale costs. Use standard increments, like 50 cents, to separate price categories. Keep drink prices based on quarters. Prices ending in quarters - $0.25, $0.50 and $0.75 - are easier for bartenders to add up mentally. List product prices with their corresponding specific portion size. For example, alongside each item in the liquor inventory, list the appropriate portion size for that drink. Point-of-sale system. Make bartenders' lives a whole lot easier! Invest in an automated system, where a few keystrokes are all that's required to find any drink or item on the price list. Traditional markup - a combination of intuition and local competition. Don't rely on intuition alone - you'd be on to a loser. Cost plus markup - here, price is determined by adding a markup to the cost of the item. Easy to apply, this method is popular in the beverage industry. Item cost percentage markup - similar to cost plus pricing, but linked to profit targets. Type of establishment. Markup is often driven by the type of establishment. For example, luxury hotels, restaurants and nightclubs can command heftier markups. Bars and taverns, on the other hand, have to compete more fiercely with similar outlets in the locality.